This tutorial shows how to wrap text in a cell automatically and how to insert a line break manually. You will also learn the most common reasons for Excel wrap text not working and how to fix it. Primarily, Microsoft Excel is designed to calculate and manipulate numbers. However, you may often find yourself in situations when, in addition to numbers, large amounts of text need to be stored in spreadsheets. In case longer text does not fit neatly in a cell, you can of course proceed with the most obvious way and simply make the column wider. However, it's not really an option when you work with a large worksheet that has a lot of data to display. 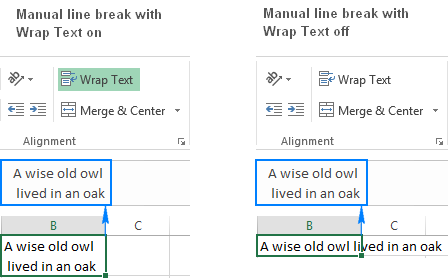 A much better solution is to wrap text that exceeds a column width, and Microsoft Excel provides a couple of ways to do it. This tutorial will introduce you to the Excel wrap text feature and share a few tips to use it wisely. What is wrap text in Excel? If columns to the right are empty, a long text string extends over the cell border into those columns. If an adjacent cell to the right contains any data, a text string is cut off at the cell border. The Excel wrap text feature can help you fully display longer text in a cell without it overflowing to other cells. "Wrapping text" means displaying the cell contents on multiple lines, rather than one long line. This will allow you to avoid the "truncated column" effect, make the text easier to read and better fit for printing. In addition, it will help you keep the column width consistent throughout the entire worksheet. To force a lengthy text string to appear on multiple lines, select the cell(s) that you want to format, and turn on the Excel text wrap feature by using one of the following methods. Method 2. Press Ctrl + 1 to open the Format Cells dialog (or right-click the selected cells and then click Format Cells…), switch to the Alignment tab, select the Wrap Text checkbox, and click OK. Compared to the first method, this one takes a couple of extra clicks, but it may save time in case you wish to make a few changes in cell formatting at a time, wrapping text being one of those changes. Tip. If the Wrap Text checkbox is filled in solid, it indicates that the selected cells have different text wrap settings, i.e. in some cells the data is wrapped, in other cells it is not wrapped. As you can easily guess, the two methods described above are also used to unwrap text. The fastest way is to select the cell(s) and click the Wrap Text button (Home tab > Alignment group) to toggle text wrapping off. Alternatively, press the Ctrl + 1 shortcut to open the Format Cells dialog and clear the Wrap text checkbox on the Alignment tab. 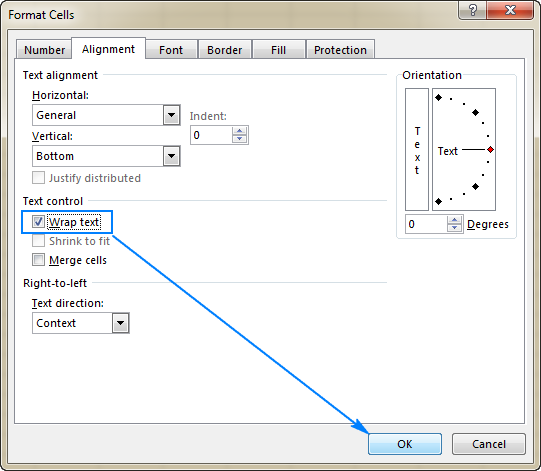 Enter cell edit mode by pressing F2 or double-clicking the cell or clicking in the formula bar. Put the cursor where you want to break the line, and press the Alt+Enter shortcut (e. press the Alt key and while holding it down, press the Enter key). As one of the most often used features in Excel, Warp Text was designed as simple as possible and you will hardly have any problems using it in your worksheets. If text wrapping does not work as expected, check out the following troubleshooting tips. Or, you can set a specific row height by clicking Row Height… and then typing the desired number in the Row height box. A fixed row height comes in especially handy to control the way the table headers are displayed. If you try to wrap a cell(s) that is already wide enough to display its contents, nothing will happen, even if later on the column is resized and becomes too narrow to fit longer entries. 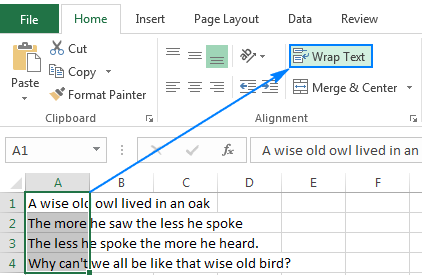 To force the text to wrap, toggle the Excel Wrap Text button off and on again. This is how you wrap text in Excel to display longer text on multiple lines. I thank you for reading and hope to see you on our blog next week! 20 Responses to "How to wrap text in Excel"
Thanks. Svetlana. Keep continuing your effort to teach us. Thank you for staying with us, Imran! Please send it to our support team (support@ablebits.com) and we will try to help. Thank u for the information. I found it really helpful. Does anyone know how to turn OFF automatic text wrapping in Excel 2016? Every time I enter or edit text, it wraps it and I have to manually unwrap. Driving me crazy! 1. Select all rows for which you want Wrap Text to be turned off. 2. Right click on the selected rows, and then choose Row Height from the popup menu. 3. In the Row Height window, just click OK, without changing the default value (15). 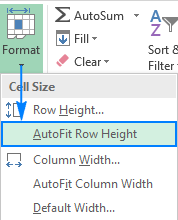 This will let Excel know that you want a fixed row height instead of auto-sizing it. 2. If I added in a cell (it wraps automatically) -> If I then do not click on "not wraped" before entering again (THAT IS EXHAUSTING), it shows the text only in the length of the cell ...so I cannot see all the text at one across my screen. In Excel 2016 - with text wrap on the last line of text in the cell does not print? I used Alt+Enter to put manual line breaks in an Excel file. When I then copied the cells from Excel and pasted them into Word, it did not retain the same line breaks? Any suggestions? How to wrap text in a way that after the line break the words move to another cell instead of every thing in a cell. When I want to see text on 2 lines in excel I set the row height to 25 or 30. I then highlight the cells and make sure wrap text is on. When I highlight the columns and double click a line to auto size the cells the ones with one word split the word. The multiple word cells work after I set the delimeters to include comma and space in the text to column tab. Some of the sheets are too large to practically use alt-enter to create a hard break. Is there a way to get excel to not split the words here? Please tell us that when i write something but it crosses that cell please tell us shortcut key of wrap text. Thank you so much. This was very helpful to me regarding inserting a break manually. There is also a keyboard method for text wrapping which involves "Enter" as one of the key combinations. I just can't remember the other key. I've tried Shift, Ctr and Alt......in vain.